Photograph showing 1932 presidential election campaign posters in Berlin, Germany, "609033 ... Watch your credit... International News Photo | Slug (presidential posters) | When Hindenburg and Hitler stood side by side | Berlin, Germany .... But it is only fair to state that the two great political opponents of contemporary German politics are not standing side by side in the flesh. They are side by side on these election campaign posters soliciting the support of the electors in the election on Monday (March 13), the results of which practically insure the re-election of President von Hindenburg in the run-off election on April tenth. The huge photograph of President Hindenburg, extending over two stories of the building above, carries the election cry: "Elect a man, not a party!" and notes that the photograph was made as late as Feb. 28, 1932. The neighboring Hitler posters call upon the voters to throw off the shackles of the existing government and predicts certain victory in the forthcoming election. 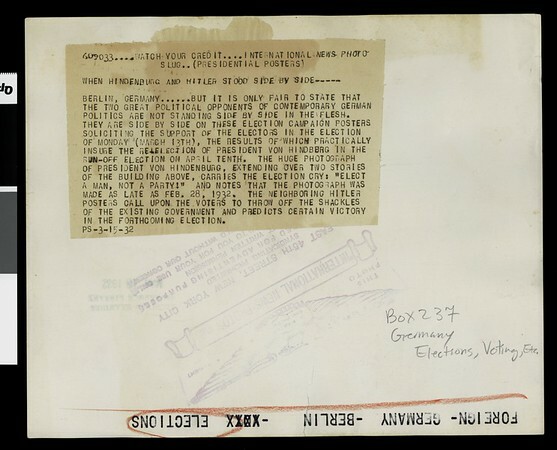 PS-3-15-32" -- typed note attached to verso. "Received. Examiner reference library. Mar 1, 1932" -- stamped on verso.